The major turning point that ultimately led to Japan’s disas­trous war with the United States and its Euro­pean allies in Decem­ber 1941 occurred late on this date, July 7, 1937, and into the next. Japanese and Chinese soldiers clashed at a bridge over the Yong­ding River near Wan­ping, a walled town 10–12 miles south­west of Beijing, China’s former capital. Years before, beginning in 1931, top Japanese civil­ian and mili­tary autho­ri­ties, including their sovereign and com­mander in chief of the Imperial Japanese Army Emperor Hiro­hito (post­humously referred to as Em­peror Shōwa), had retro­actively sanctioned the seizure of Man­churia by local army com­manders stationed in China’s north­east following the so-called Mukden Incident. From this Man­churian spring­board—a puppet state named Man­chukuo hatched by Japan’s China-based Kwan­tung Army—the Japanese by the summer of 1937 had expanded the reach of their armed forces south­ward into China proper to a point where their soldiers now surrounded Beijing and Tianjin (Tientsin), the latter a major seaport and water gateway to Beijing. Local Japanese commanders only needed a casus belli to justify seizing Beijing and Tianjin. They found it at an eleven-arch granite bridge named after the Italian explorer, Marco Polo. On the night of July 7/8 a Japanese rifle company stationed outside Beijing con­ducted unannounced training exer­cises near Wan­ping and exchanged gun­fire with Chinese forces. Hours later Japanese soldiers attempted to breach Wan­ping’s walled defenses to search for an allegedly missing soldier (the story is murky) but were beaten back. Around 4 a.m. reinforce­ments from both sides poured into the area. An hour or so later Japanese forces opened fire and attacked the nearby Marco Polo Bridge (also known as the Lugou Bridge) as well as a rail­way bridge to the north, part of the main rail­ line west of Beijing that held considerable strategic value for both sides. Despite efforts by senior-level diplo­matic and local army com­manders to defuse hosti­lities, which briefly included a cease­fire, the Marco Polo Bridge Inci­dent led to more Japanese-con­trived clashes between the opposing armies (Japanese heavy artil­lery shelled Wan­ping on July 14), as each side mobi­lized rein­force­ments. 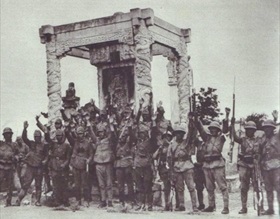 By the start of the next month a clear-cut Japanese victory had emerged in the Battle of Beiping (Beijing)-Tianjin (early July to early August 1937). That battle, or rather series of battles that involved heavy casual­ties and was backed by Japanese tanks, war­planes, and naval forces, is recognized as the start of China’s War of Resistance (1937–1945), or as it is known in the West, the Second Sino-Japanese War. 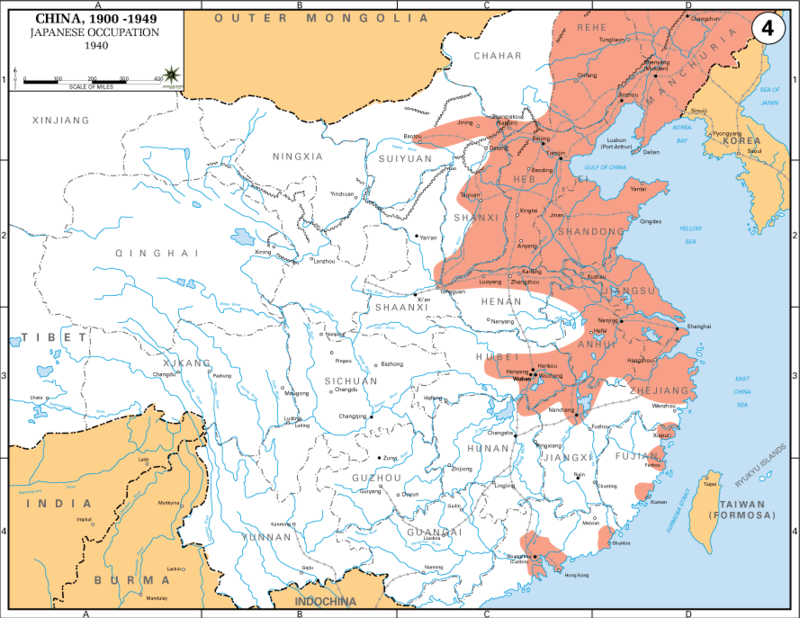 Above: Map of China, 1940, showing the extent of Japa­nese imperialism (in bur­gundy). In its quest for an empire in Asia, Japan seized Taiwan in 1895, declared Korea an imperial protec­torate in 1905, and invaded Man­churia (Man­chukuo) in China’s north­east in 1931. The decision of Japan’s modernized mili­tary and civil­ian leader­ship to expand Japanese mili­tary activity along the entire Chinese sea­board and work inland, after closing the door to further diplo­matic engage­ment with the Chinese govern­ment in January 1938, dragged Japan into an unwinnable war. The out­come was Japan losing all of its territ­orial gains since the start of the First Sino-Japanese War in 1931. 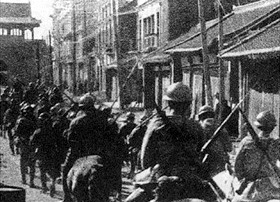 Left: Japanese cavalry entering Mukden (Shen­yang), Man­churia, Septem­ber 18, 1931. Japan’s Kwan­tung Army on the Chi­nese main­land fabri­cated a bombing inci­dent on a tiny por­tion of the Japa­nese-owned South Man­chu­ria Rail­way as a pre­text to occupy Man­chu­ria, a pro­vince semi-inde­pendent of China, and other areas in North­eastern China. Man­chu­ria was rich in mine­ral and agricul­tural resources. Most West­erners believed the Muk­den Inci­dent (aka Man­churian Inci­dent), although coming on top of other Sino-Japa­nese armed clashes (so-called “incidents”), was way over­blown and should not have led to Japan’s takeover of Manchuria. 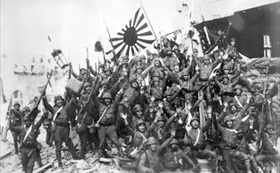 Right: Japanese infantrymen celebrate their seizure of the Marco Polo bridge. Man­chu­kuo became the launch pad for further Japa­nese hostile acts in China. Localized armed clashes resulted in out­lying pro­vinces being annexed into Man­chu­kuo or turned into buffer zones, effec­tively under Japa­nese occu­pa­tion. By the start of 1937 all the areas north, east, and west of the large Chin­ese city of Bei­jing were con­trolled by Japan. On July 7–8, 1937, the Japa­nese pro­voked an­other “inci­dent” at the Marco Polo Bridge south­west of Beijing, as well as at a rail­road bridge to the south­east of the city. The rail­road bridge over the Yong­ding River was a choke point on the Beijing-Wuhan rail line and the only passage linking Beijing to non-Japanese-controlled areas to the south. Left: Heightened tensions following the Marco Polo Bridge skirmish led directly to Japan’s full-scale inva­sion of China in the Second Sino-Japa­nese War, begin­ning with the Battle of Bei­jing-Tianjin (early July to early August 1937) and the Battle of Shang­hai (August 13 to Novem­ber 26, 1937). 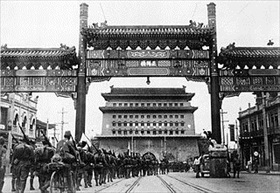 In this photo Japa­nese troops are shown passing from Bei­jing into the Tartar City through Chen-men (Qian-men), the main gate leading to the palaces in the For­bidden City, some­time in mid-August 1937. Right: Japanese marines celebrate their success­ful landing near Shang­hai in mid-August. Approx­i­mately 200,000 Chi­nese and 70,000 Japa­nese died during Japan’s three-month attempt to take Shang­hai, South China’s indus­trial and eco­no­mic center. Shang­hai was the first of 22 major engage­ments between the Chinese Nation­alists under their leader Chiang Kai-shek. Japan’s War Minister Hajime Sugi­yama had foolishly pre­dicted the Chinese would be crushed “in about a month” and sue for peace. Sugi­yama’s dual pre­dic­tions, which Emperor Hirohito accepted, were trag­ically off the mark. Of course, it was Japan and Hirohito who sued for peace. The Chinese War of Resis­tance lasted nearly eight years, and it accounted for most of the mili­tary and civil­ian casual­ties in the entire Pacific War. More than 4 mil­lion Chinese and Japanese mili­tary person­nel and any­where from 10 to 25 mil­lion Chinese civil­ians died from war-related violence, famine, and other causes.